Let me be completely clear about the Klibanoff girls’ athletic prowess: it is limited. Look, we’re in fine shape. We can swim, run, pick up heavy things, move around on wheels – that’s all good. But the hand-eye coordination required of ball sports is…a whole different ball game. As kids, all three of us played on youth softball teams. While Eleanor was definitely relegated to the role of catcher, I hit at least a few foul balls into the roaring crowd, thrilled with the cheers of “You got a piece of it!” and happy to take any walk I could get. Despite this, our enthusiasm for attending baseball games was not diminished, and in fact increased once we reached legal drinking age and could enjoy the Ted to its fullest extent. And yet, it’s slim-pickings when looking for female baseball stars in popular culture. There is one shero whose name has made it into the history books for an astonishing feat: 17-year-old Jackie Mitchell, who legendarily struck out both Lou Gehrig and Babe Ruth, one after the other. In 1931, the New York Yankees were scheduled to play an exhibition game against the Double-A Lookouts in Chattanooga, Tennessee. The owner of the Lookouts was Joe Engel, an entertainer with an eye for lucrative opportunities. He announced he had signed Jackie Mitchell a few days before the Yankees came into town. This was definitely not a feminist move; he basically did it #forthevine, and for the 4,000 fans who bought tickets. The 5’7” 130-lb teenage Mitchell was a legit pitcher with a mean sinker shot, trained by her neighbor, MLB pitcher Dazzy Vance. She already had a job pitching on a women’s team in Chattanooga, but jumped at the chance to sign a contract for the 1931 season with the Lookouts. Ick. In the first inning, Mitchell took to the pitcher’s mound, with Babe Ruth at bat. She threw her signature sinker, which dropped right before the bat; Ruth took a ball. The next two throws were strikes. If you’re Babe Ruth, 36 years old, 17 years into your career as an MLB superstar, an American hero and celebrity, and a teenage girl has you at two strikes and a ball, what do you do? Apparently you ask the umpire to inspect the ball. Then, you swing at a third pitch, and miss. And you throw the bat as you head back to the dugout. And you tell the press, later, that women are “too delicate [for the sport.] It would kill them to play ball every day.” Nice. Lou Gehrig took the bat next. He had a .341 batting average that season. He swung, and missed, at three pitches in a row. Mitchell was inexplicably pulled from the pitcher’s mound after walking the next batter, and the Yankees ended up winning 14-4. A few days later, the commissioner voided her contract with the Lookouts. He said it had been a joke and the game was “too strenuous” for a girl. Baseball season, which is now upon us, always means spring, and spring means a fresh start. It means an opportunity for new records and new accomplishments, and a zeroed-out scoreboard. 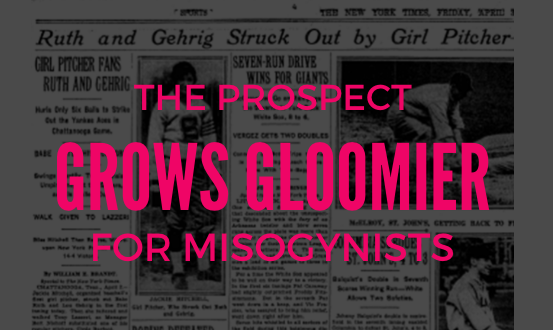 It’s a chance to rethink just how level that playing field is – to acknowledge how far we’ve come since 1931, and how we might have further still to go for women in baseball and in all major sports leagues. Thanks to Jackie Mitchell, the women’s national team and other pioneers breaking the gender barrier, the prospect grows gloomier for misogynists.